Terrific article dated June 16th. 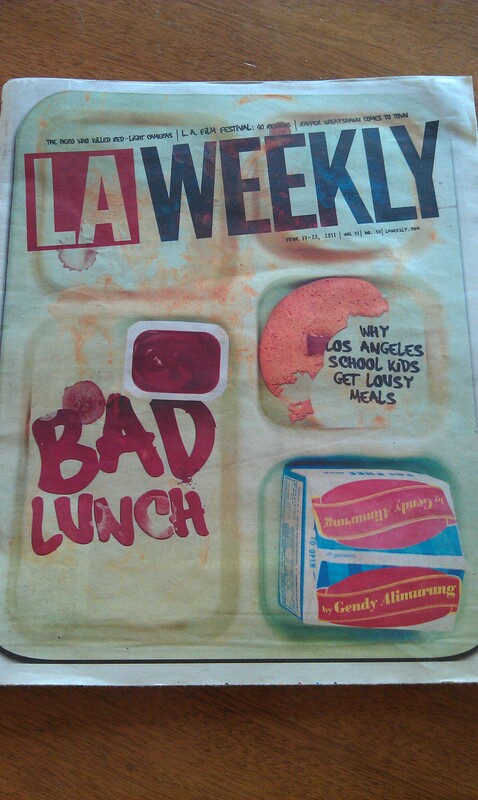 For the record, I am nowhere near LA, but my sister-in-law is and snagged a copy of the paper for me. The article resonated with my because it talks not only about the processed food on the menu, but also the pathetically short amount of time gets actually get to eat. I’ve discussed both of these problems in previous blog posts. In addition to the length of students’ lunch breaks, the article touches on the high quantity of sugar in the food. Too much sugar is a really big problem. School district food officials say their biggest challenge is to produce healthy food that is both cheap and appealing to students. Healthy meals do no one any good unless they are being eaten. When did healthy food get expensive and stop being appealing? How did we get to this place? Because people don’t care that much about food. I worry that the United States just doesn’t value food like other countries. I believe our culture is dominated by fast food corporations, which has led to two divergent outcomes. Our culture is experiencing a huge decrease in home cooking and, on the other side of the spectrum, an increased reverance for chefs as people who possess unattainable skills (see: Food Network). Without a doubt chefs are special, but delicious and affordable home cooking is within reach for all of us. For example, if you drive you probably have seen the billboard ads for the McDonald’s smoothies and I’ve also heard them described on radio ads as containing “exotic fruit.” Are you kidding me? A smoothie is one of the easiest things to make at home and the last time I checked bananas and apples are at my local grocery store. Do you need fancy equipment? Before we got married and registered for a “nice” blender, we “got by” with one my husband found at a garage sale for five bucks. It worked great for many years and my husband even repurposed it into a lamp (I think it’s in a box somewhere now). My mother-in-law recently made my son some strawberry milk. She took milk and strawberries, put them in a blender, and before our eyes we had pink milk. It’s that easy. Whatever you want to call it — pink milk, a fruit drink, or a smoothie — you can do at home for little money and effort. I’m learning that the worst part is doing the dishes! Previous PostLunch Wrap Up – Weeks of June 20th and June 27thNext PostBook review and giveaway: Jump Start Health! Wow, one thing in that article jumped out at me – 2000 students going to lunch at once? Even in my little small town schools, they stagger lunch times. It’s just common sense that many people can’t be served in that short of a time. That seems to be totally nuts to me too. That number has to be wrong! Thanks for commenting! i didn’t read the article, but wanted to comment on what you said. you’re exactly right. we’ve become a nation that is used to the way that fast food tastes. we want home cooked meals to taste like chemically-laden mystery meat with a side of fried everything. should a fast-food restaurant happen to *gasp* actually cook a real egg to make a sandwich to place on top of a partially hydrogenated-oil soaked biscuit, we are quick to pat them on the back for it! not to mention, we think we’re getting a bargain because we paid a dollar for it. if we stopped and calculated about how inexpensive it is to make that same meal at home, even with REAL meat, our minds would be blown. it’s not hard to cook at home, but we have to set aside the time, make cooking more family oriented, and have the desire to learn. In all honesty, the “exotic fruit” mentioned in the McD’s ad is mango and/or pineapple, which is their newest smoothie. Having said that, I never thought to make pink milk that way! I’ve been doing smoothies for awhile, but I need to make some purple milk with blueberries! Interesting article. We have a much smaller school district, but my daughter had similar problems in middle school. They get 1/2 an hour for lunch and my daughter, who is in the TAG class, is all the way across the school (and on the 2nd floor) from the cafeteria. She was consistently eating the pizza and fries versus the “one main and two sides”, which is healthier, because she didn’t have time to wait in the line. The pizza and fries are grab and go. I found out that the school plans the meals by the average number that are served the previous month. The pizza and fries are substantially less expensive than the other option, which includes fresh fruit and vegetables. I think they must make the luch periods so short to cut down on the number of wholesome meals they serve, and increase the pizza and fries, so it cuts down their overall expenses. We now pack lunches for both our children. It’s worth the extra money in groceries, and they would rather have a packed lunch. It tastes better than school food, and they can use their 1/2 hour to eat versus stand in line. Maybe we’re somehow helping out the kids who can’t get a packed lunch at home by taking our two out of the line. Our tastes to change… I was reading a blog written by someone who had decided to switch to a raw food diet. She previously was vegetarian. But more of a junk food vegetarian (too common!). She hated vegetables! She said after going 100% raw for a month, her taste buds changed and she began to appreciate raw foods and vegetables – even began to some LOVE vegetables and crave salads. Here in Australia the latest ‘awesome’ McDonalds incention is porrige. Yup. Porrige. Get delicious, hot oats on your way to work without the hassle. And so cheap! Cause Oats are so expensive? ook a big batch on the weekend, or on a Monday, and warm up the amount you want if you’re that strapped for time! Or let them cook while you do your hair and makeup. Food is not rocket science people! Heidi, do you really think that? You don’t know much about schools than, and probably haven’t read a newspaper in the last ten years. Schools are facing incredble pressures to increase test scores, and that means increased instructional time. Sounds good, right? But what gets cut is lunch periods. The districts can’t afford to pay teachers for a longer day, and many schools have cut paraprofessional staff (those folks who also supervise the lunch rooms) to the bone. And a key fact here is that the people who schedule the school day are not connected in any meaningful way to the nutrition department. In fact, as the school principals put more pressure on the nutrition folks to cut the time it takes to serve lunch, these relationships can be very stressed. No one in school nutrition departments wants to feed kids like cattle at a trough, but if the school and the community don’t see lunch as important, that’s what you get.